There’s zeppelin on the curent banner for this site, and we’re notorious pulp gamers, so it should come as no surprise that zeppelins are amongst our favourite things here on The Warbard. Sure, they’re often explosive, prone to crashing in a stiff wind and all the rest, but let’s face it, zeppelins are just cool. In A World More Pulpish (which is a much cooler place than reality) there’d be zeppelins everywhere. One glimpse of how A World More Pulpish might have looked, with zepps overhead, is found in this Feb. 2010 post over on Propnomicon, Zeppelin Goldmine. Incidentally, the zeppelin graphics featured (in various versions) on the banners for this site are derived from the scanned PDF of this book; I imported individual pages from the PDF into GIMP, did some cleanup and contrast adjustment, then moved the images over to Inkscape (which we have written about before here on The Warbard) to convert them to SVG vector images (which have the huge advantage that they’re infinitely scalable, and in many ways easier to edit than regular bitmap images) to use in our banners and other projects. 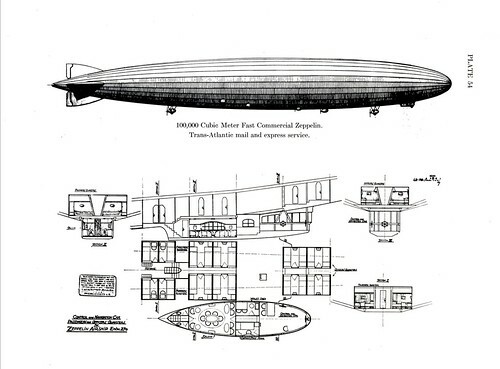 Lots of other good inspiring stuff over on Propnomicon, too, not just zeppelin plans. I highly recommend checking it out!